Click the link below to view the test results. So on lower grate at 11" is over 20 deg hotter than other locations. My guess that if you check at 5" it would be even higher. On the other grill the problem is the radiant heat from the heat diffuser (drip pan). As the pan heats up the radiant heat overwhelms the convective temperature distribution. As radiant heat transfer is very sensitive to distance, the distance from the diffuser to the grate can have a significant impact on local temperatures. Do you have similar temperature data for the 1500? Is the distance from the diffuser plate to the grate the same on the 1500? The 1500 has the firebox mounted below the bottom of the cooker, where as the 640 has the firebox mounted on the the bottom inside of the cooker. 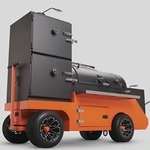 The physical fire is below the bottom of the cooker in the 1500 and above the bottom of the c cooker in the 640 and 480. Temperature readings in an empty cooker will be completely different once something is put in the cooker to cook. The thermal dynamics change as do the heat and airflow. "The thermal dynamics change as do the heat and airflow." On the other product adding meat compounded the problem. Less free space for convective flow means the radiant heat problem gets worse. Can we have this conversation without and audience? Email me? If you own the product, send an email to customerservice@yodersmokers.com and include the serial number and build date, otherwise email info@yodersmokers.com. So if I read this correctly, If I want to set it and forget cook I should just set the temp and let the YS1500 do its thing. The controller has been "programmed" to know what the grate temp is even though it is mounted 2" off the grate in the back left corner? What I see on the display should be the grate temp? gerytb wrote: So if I read this correctly, If I want to set it and forget cook I should just set the temp and let the YS1500 do its thing. The controller has been "programmed" to know what the grate temp is even though it is mounted 2" off the grate in the back left corner? What I see on the display should be the grate temp?